Corporate & Investment Banking professionals make deals with the most sophisticated corporate and government financial decision makers, compete with the most talented and aggressive competitors and build internal and external alliances with many of the most intelligent and demanding people in the world of corporate finance (Treasury management, capital markets, compliance, credit, legal, tax, sponsors, syndicate bankers etc.). Having the ability to successfully manage and grow these relationships is what separates the best bankers in the business from lower performing bankers. We've studied the best-of-the-best and have found that they possess both high levels of financial IQ and high levels of Emotional Intelligence (EQ). The best-of-the-best (Weinberg, Rohatyn, Merrill etc.) were -- and are -- almost always as good on the people side of the business as they were and are on the financial side of the business. 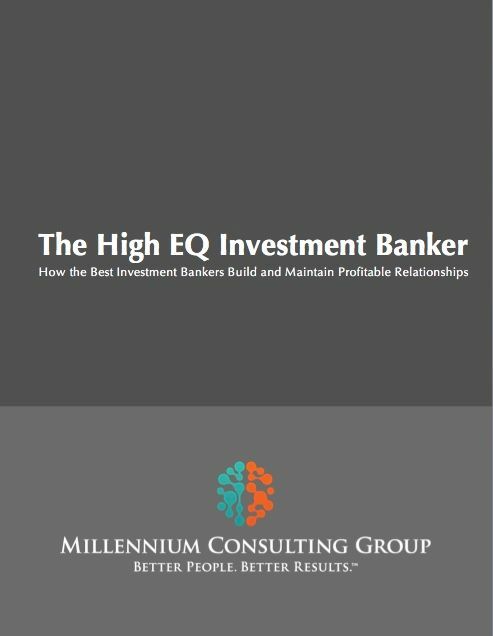 Our High EQ Investment Banker workshop is designed to immediately and positively impact participant EQ levels by working with them to understand and develop the personal development and relationship development mindsets and skill sets of the most successful investment bankers in the industry. This fast paced, highly practical and highly interactive program takes the EQ discussion beyond general theory by delivering industry specific functional best-practices that will challenge participants to elevate the quality of their personal growth and relationship development efforts.